EW has many little and big rules or guidelines. The practitioner is tasked with applying these, sometimes almost blindly and not question the result. When you peak you drop back to the 4th wave of previous degree. 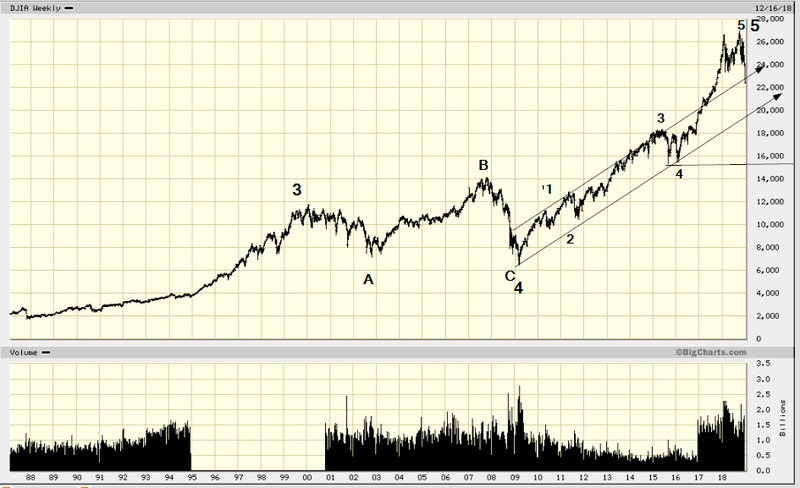 If you are not sure what previous means in this context just go for the simpler 4th wave in the past. That, in this case, is just below 16000. 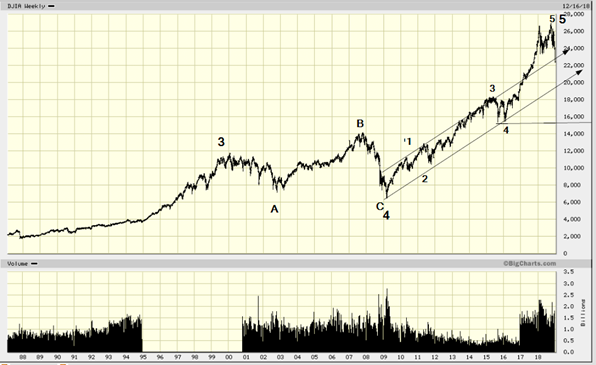 The real 4th wave of previous degree is, of course, much lower at about 6666 set at the low in May 2009. Roughly the 5th wave channelled above goes from 7000 to 27000 or 20000 points. A , more or less MINIMUM retracement would be about 38% of that or almost 8000 points. That is where the bottom channel line runs today, 19000. However a more “normal” retracement would be 62%, or 12000+ points to about 15000. 5th waves are the last wave in a 5 wave sequence. Normally the entire 5th wave is retraced which targets somewhere slightly below 7000. But this whole sequence starts somewhere with the South Sea bubble in 1711 or a little earlier. Of the 300 plus years of history we only show a miniscule portion. The real 4th wave of previous degree is at the low of 41 in the wake of the Great depression of 1929 etc. People will think I am an idiot if I were to seriously suggest that, so I don’t. It is like road signs. If you go South you do not see a sign “Rio, Brazil”, instead it will say “Detroit”. Same principle.